For the best self-defense weapon that you can carry around with you, the Camouflage Steel Monkey Fist Keychain has just what you need. This monkey's paw weapon is made out of strong green and brown camouflage-colored nylon cord that's wrapped around a 1/2" steel ball. This dense, 1 oz ball packs a huge wallop and wounds mightily when swung at someone's bare flesh. 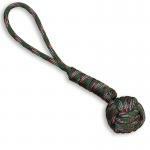 The 4.5" inch paracord is enough to get it to gain some real momentum when you swing it. 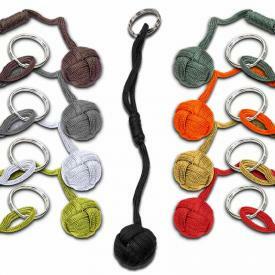 If you're in the mood to defend yourself from an attacker at close range, this paracord monkey's fist will either break some bones or make people think twice before attempting to steal your wallet. 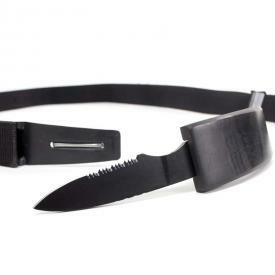 When you're not using this hidden weapon, it appears like a decorative little key fob that you can put on your keychain. People will think you like camouflage paracord or that you're just making a personal statement. Well, you are making a personal statement: "don't mess with me!" The camouflage paracord monkey fist is easy to use and looks harmless to the untrained eye. Put one on your keychain and never leave home without it.